Avinash Treebhoowon says he never read the confession document which police allegedly forced him to sign. 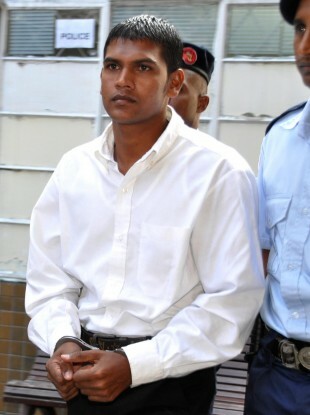 ONE OF THE TWO men accused of the murder of Michaela McAreavey in Mauritius last year has told the court that he only confessed to her killing because police had threatened to torture him. Taking the stand for a second day, Avinash Treebhoowon said he had “never seen, never talked to, and never knew” the Co Tyrone schoolteacher, but had confessed to killing her after officers of the Major Crime Investigation Team had threatened to kidnap his family. Treebhoowon also claimed that all four statements he gave to police in the aftermath of McAreavey’s death were either false or incomplete. Both Treebhoowon and Sandeep Moonea have both pleaded not guilty to the murder of McAreavey while on honeymoon with her husband John at the former Legends Hotel. Yesterday, Treebhoowon claimed in great detail how he was the victim of police brutality, telling the court he had been forced to lie naked on his belly, while four officers restrained him by the hands and feet, and a fifth plunged his head into a bucket of water ‘six to seven times’. “I felt like drowning and could not breathe. He then raised my head and hit me his fist on my back. I vomited blood”, he claimed. He claimed the officer in charge of the enquiry then threatened to kidnap his family if Treebhoown did not confess. to the murder. “Take his wife, father and mother and put them in jail. Bring his wife here, give her a passport and visa because this man’s [John McAreavey] wife is dead and he will now need a woman to live with him”, the officer is alleged to have said. The accused said he had begged the inspector not to involve his family, after which he signed a document “which I did not read, neither did he read its content to me. “At this point, I thought only my family,” he said. Proceedings were adjourned for some time at this point, as Treebhoown had started crying – though when they resumed, presiding judge Prithviraj Fekna asked the witness to “control your emotions”. The court was told that Treebhoowon had made his confession on January 11 – and that it was six days later before the accused first reported the alleged police brutality against him. Treebhoowon also denied that his co-accused, Sandeep Moonea, was with him at any time in room 1025 – the McAreavey’s room in which Michaela was found dead. In response to other questions, Treebhoowon said he was still taking medication prescribed by a psychiatrist, as he was still having nightmares following the torture he claimed the police officers had inflicted on him. Under cross-examination, a tired Treebhoowon had some difficulty in explaining discrepancies in the times of various actions logged in his report sheet, and those recorded by the hotel security systems. He also could not explain why he not named another member of staff, who is responsible for the hotel complex’s boathouse, to whom he claimed to have been speaking at the time Michaela was killed. Email “Michaela McAreavey trial: Prime suspect ‘only confessed because of police torture’”. Feedback on “Michaela McAreavey trial: Prime suspect ‘only confessed because of police torture’”.